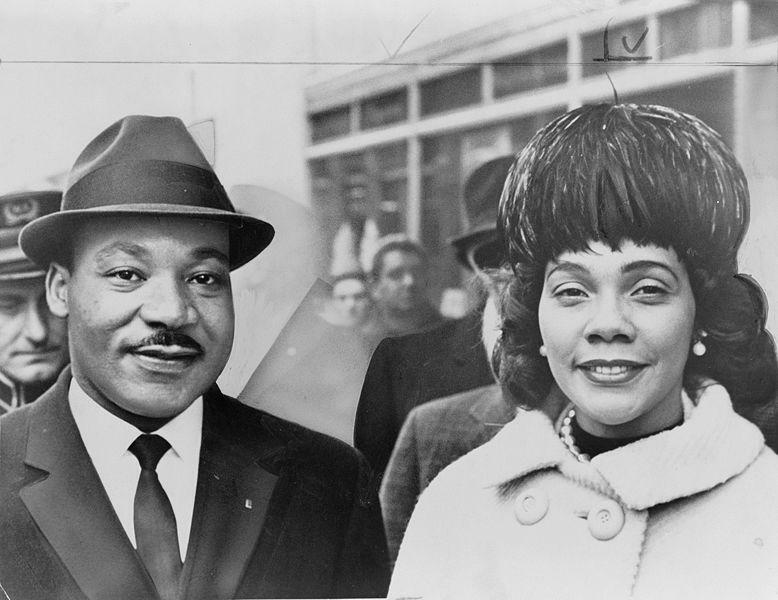 Martin Luther King, Jr. and Coretta Scott King in 1964. The recent attempt on Representative Gabrielle Giffords life sparked new debate about the state of public discourse in our country. How could this have happened? What does this type of violence say about us? Have we reached a breaking point? As the news rolled in, and it appears the violence might have been the work of a mad-man, hearts were still broken, but there seemed to be some relief that the act seemed less about our politics, and more about a lost soul. Events like these are unsettling, and it often makes me wonder what it was like for Americans when the violence was more directly tied to our political discourse. The Reverend Dr. Martin Luther King was shot and killed in Memphis in 1968. Violent riots followed in what surely must've felt like an unraveling of American society. King was 39. I was born eight months later. Like a lot of people, I only know about King through books, pictures, or perhaps a grainy video of the "I Have a Dream Speech." Now it's 2011. The information age is hitting its stride, so we can see and hear King in ways we couldn't before. We can watch video of his interviews on Meet the Press. We can see King tell a joke on a talk show. We can see what he said in a speech the night before he was killed, and we can watch Walter Cronkite tell the nation that the man who helped change our society was dead. One video that will likely lead you to many others (as YouTube often does), is an interview Mike Douglas conducted with King on November 2nd, 1967, five months before King was killed. The singer Tony Martin was there too and tossed in some questions. "I think our power must be much more than military power. We don't need to prove to the world, or to anybody, our military power, we've got to prove our moral power." Singer Tony Martin asked if King was worried about offending whites who support the civil rights movement. The same whites who are also supportive of the war. "You stand up for what is just because it is just and right. I think it was T.S. Eliot who said there is no greater heresy than to do the right thing for the wrong reasons...and I submit to anyone who would stop supporting civil rights because of a stand against the war on the part of some leaders, ended up doing the right thing for the wrong reason. They were never truly committed to civil rights in the beginning." Watching this video, I get new sense for who King was, and maybe you will too. "I'm just trying to do a job, and I think it's a job that has to be done...for America, because I think it's true that if this problem isn't solved, the soul of our nation will be lost, and the only way to redeem the soul of America is to remove or to eradicate racism and all of its dimensions." "It becomes a tragic period in our nation when we equate dissent with disloyalty. I believe firmly that it is necessary to have these moments of dissent in order to challenge something that may be leading the whole nation down the wrong path." Feel free to share your thoughts about the Reverend Dr. Martin Luther King with us today. How might he view where we are today? And where online do you go to learn more about Dr. King?